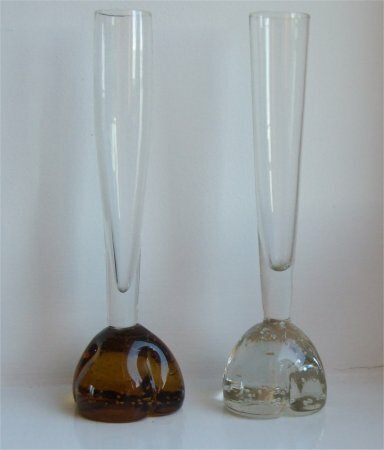 Shown below are two more of these vases in amber and clear, but without labels. 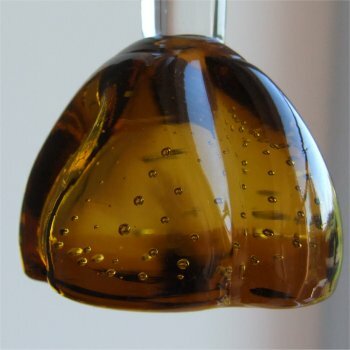 The amber has a very slightly bulbous stem but otherwise with exactly the same characteristics. They are both 160mm (6 & 5/16ths) tall. 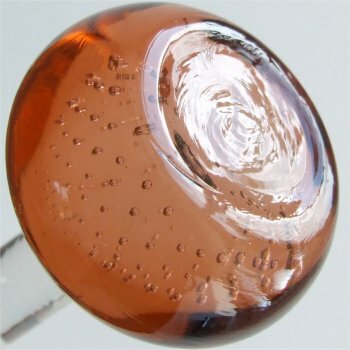 The amber has a clear stem 22mm (7/8ths of an inch) across, and the clear has a clear stem 25mm (1 inch) across. 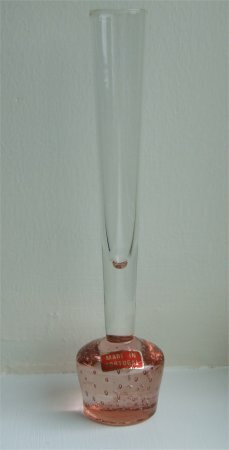 This peach vase is approximately 210mm (8 1/4") tall. 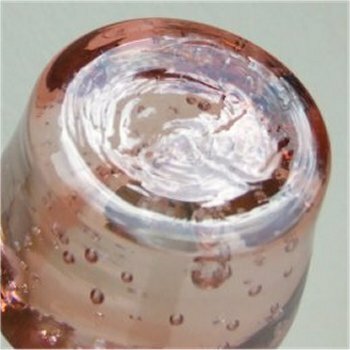 The base is round and has small graduated bubbles (smaller at the top) that come up in a spiral. 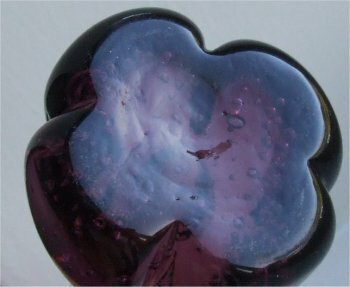 The bottom of the base has an outer circle and a shallow depression (see image below). 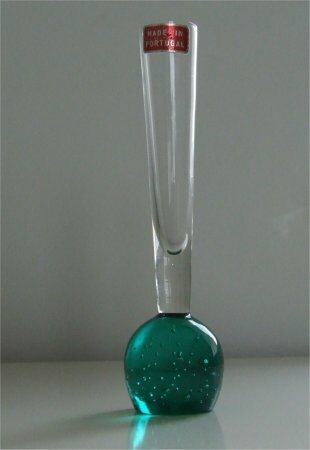 The clear glass stem is bulbous and flares out at the bottom. 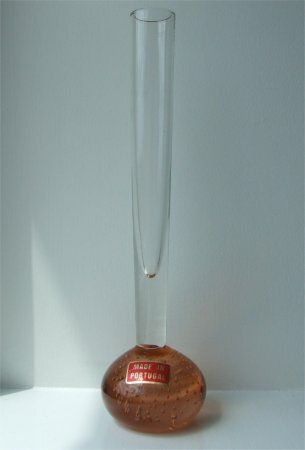 The flare being approximately 36mm (1 1/4 inches) in diameter. 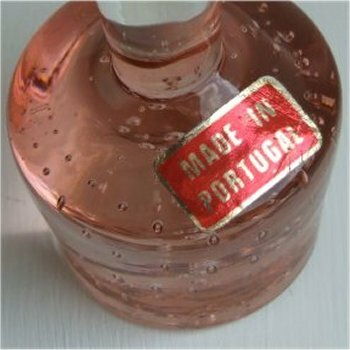 The label is oblong in shape and is coloured a metalic red with a gold border and lettering: 'MADE IN PORTUGAL'. 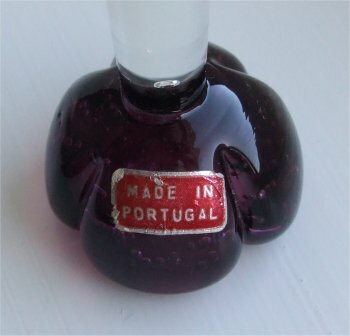 This shape was also made in Sweden, but the Swedish vases would have a completely flat and polished base. 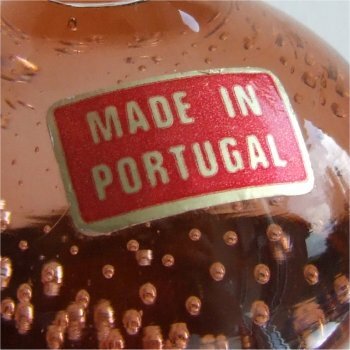 Turkey also made a similar shape, (see ACC) but it has random bubbles. 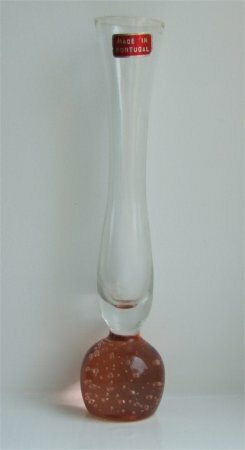 This peach vase is approximately 208mm (8 & 3/16ths") tall. 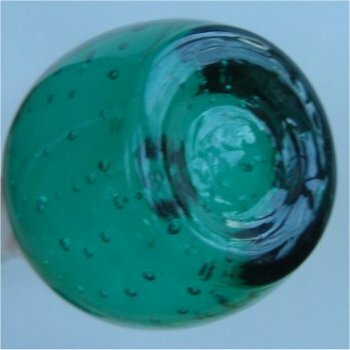 The base is a slightly flattened ball shape and has small bubbles which come up in a spiral. 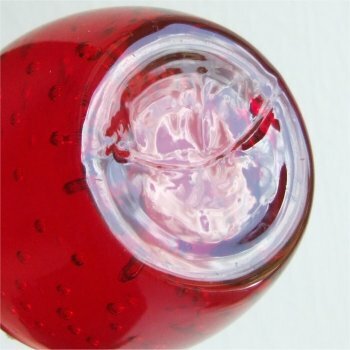 The bottom of the base has an outer circle and a shallow depression with a creased finish. (see image below). 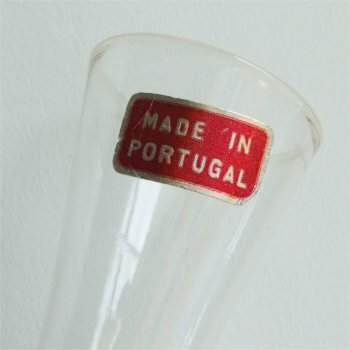 The clear glass stem has a narrow flare being approximately 23xmm (7/8ths of an inch) in diameter. 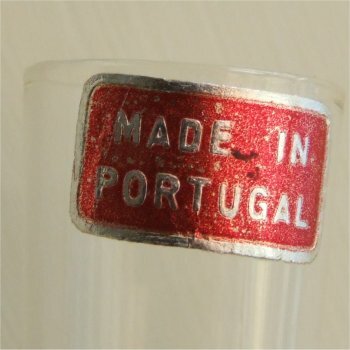 The label is oblong in shape and is coloured a metalic red with a gold border and lettering stating 'MADE IN PORTUGAL'. 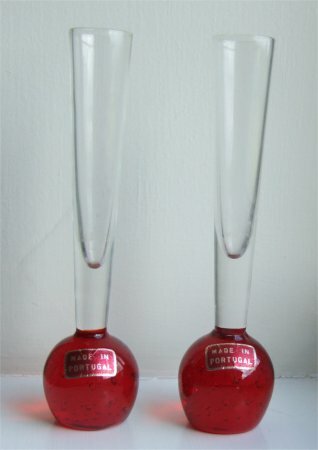 These red vases are approximately 160mm (6 1/4") tall. 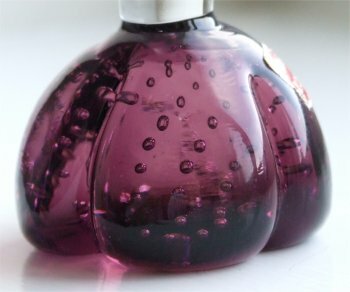 The bases are ball shaped and have medium bubbles that come up loosely in a spiral. 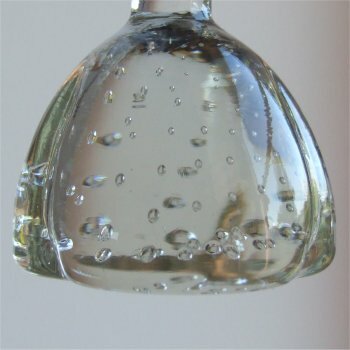 The bottoms have a circular depression (see images below). 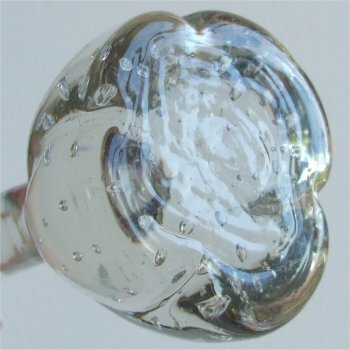 The clear glass stems have medium flares being approximately 24mm (9/10ths of an inch) in diameter. 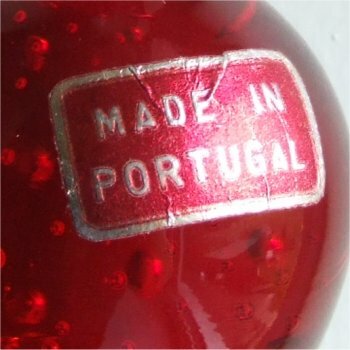 The labels are oblong in shape and are coloured a metalic red with silver borders and lettering, stating 'MADE IN PORTUGAL'.